Disclaimer: On a scale of 1-10 (1 east, 10 hardest) this job ranks a solid 7 for me. Oil change ranks a 0. Clutch ranks a 9. This is NOT for the timid or the first time wrench turner to tackle alone. 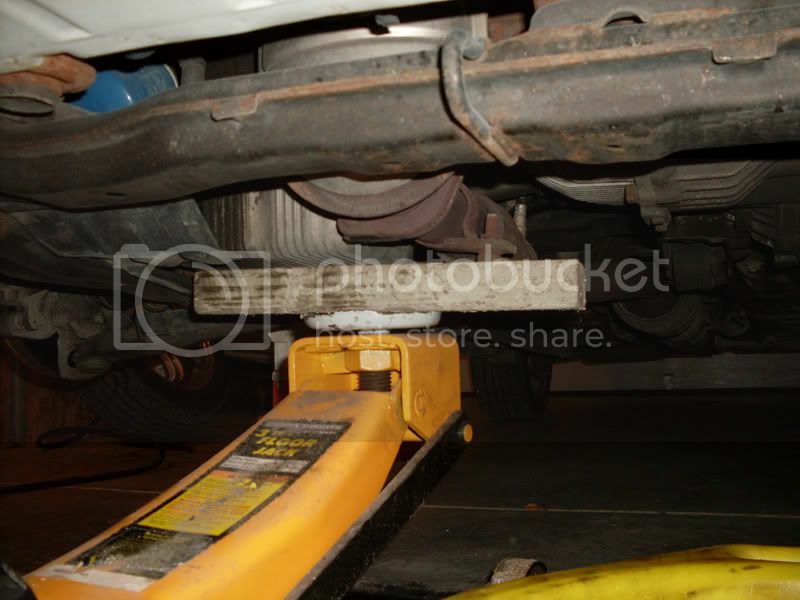 First off, get the front of the car in the air and support with jack stands on the lift location on each side. Use the front crossmember/tow hook to lift from. 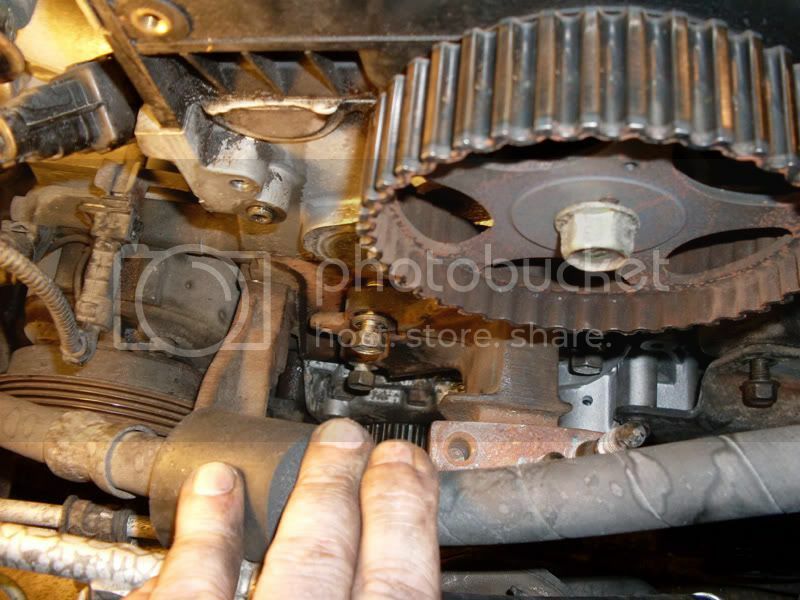 REmove the passenger front tire, the inner plastic shield (2- 10mm bolts) covering the engine annd crank pulley (do not discard, MUST be reinstalled). Remove the orange plastic plug in the driverside bottom of the radiator to drain the radiator of coolant. MAke sure the crank pulley's mark is also lined up on the timing tab. It's really hard to see, even more so if your car has lived it's life in the salt belt. 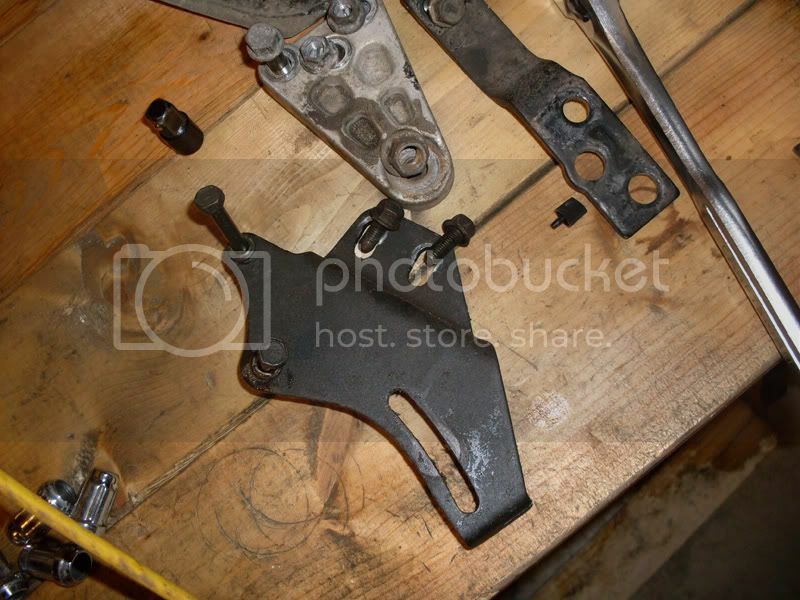 Next, support the engine with the jack, placing the small piece of wood between the jack and the oil pan. 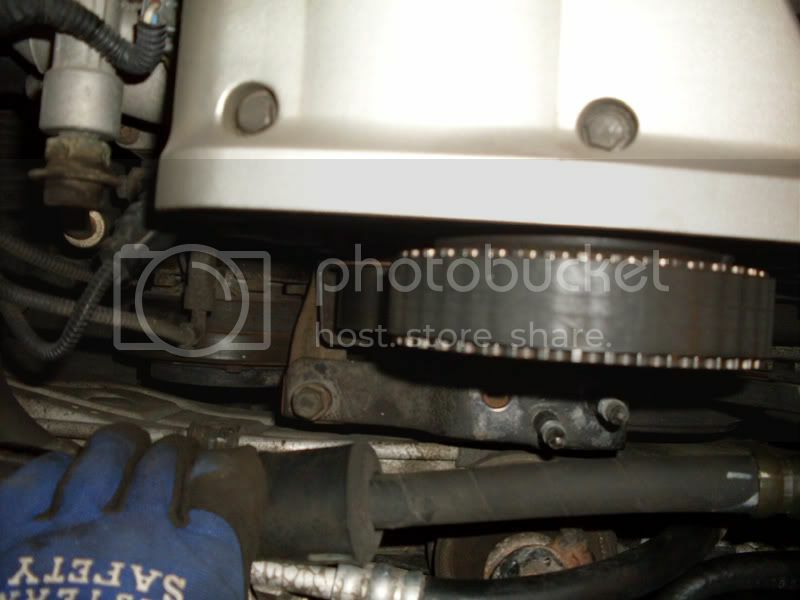 This will be uitilized to raise and lower the engine to access bolts as you go, so make sure its stable as it will be the main thing holding the end of your engine up. The engine is no fully supprted by the jack and can be manipulated to access the hard to reach bolts.... like the ones you are about to remove. Raise the jack until the engine stops lifting. 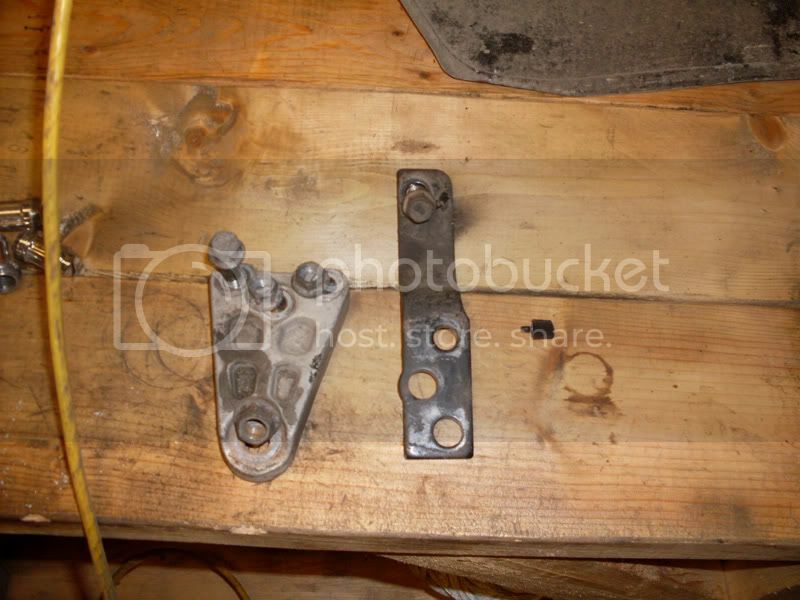 Now, take your 10mm wrench and break the 4 10mm bolts loose that hold the waterpump pulleys. Do not remove yet, just loosen. The belt tension "should" keep the pulleys from spinning, but additional pressure may be required. Remove all 3 belts. set off to the side to compare with your new belts before reinstalling. Next, loosen and remove the large center bracket that holds the mount arm (this is optional, but makes access to the w/p MUCH easier). 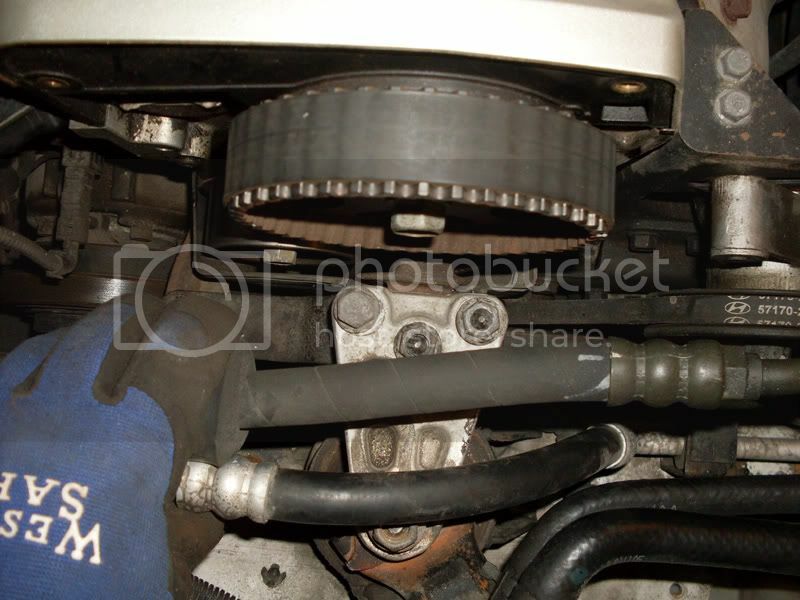 Then loosen the timing belt tensioner (14mm bolt), the idler (14mm bolt) and the timing belt. Next, remove the 4- 12mm bolts holding the alt bracket to the block/waterpump and remove the alt tensioner and set off to the side. Remove the last 3 bolts holding the waterpump to the block. You will likely have to pry/bump the waterpump loose at this point as the gasklet and sealant are holding it to the block. Once removed, clean the surface of all sealant and gasket material leaving only the bare block. 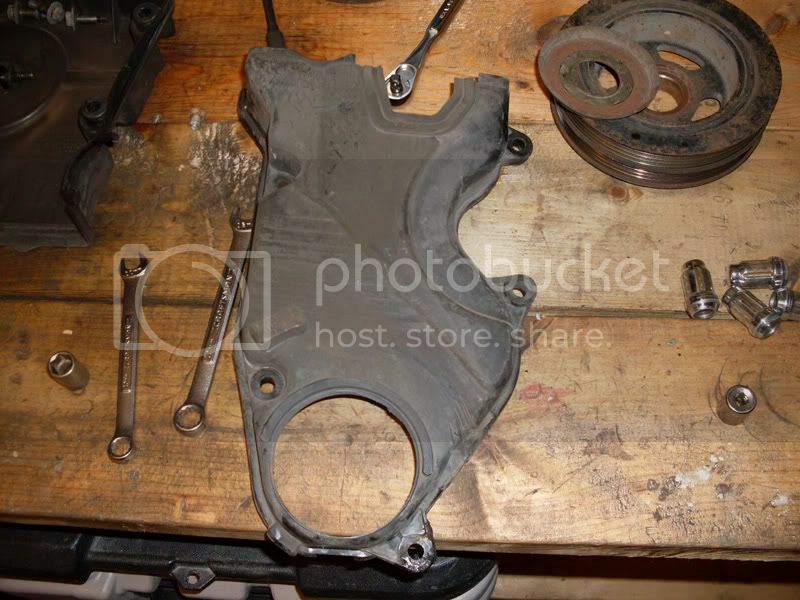 Once the surface is clean and dry, apply a thin film of Grey RTV to the waterpump, lay the gasket onto the rtv and then apply another thin layer of RTV to the block side of the gasket. This will help seal any differences between the two mating surfaces and keep you from needing to remove the whole assemly and do it again (did that on my first pump years ago). reinstall pump and allow the RTV to cure for at least 30 minutes before adding coolant. 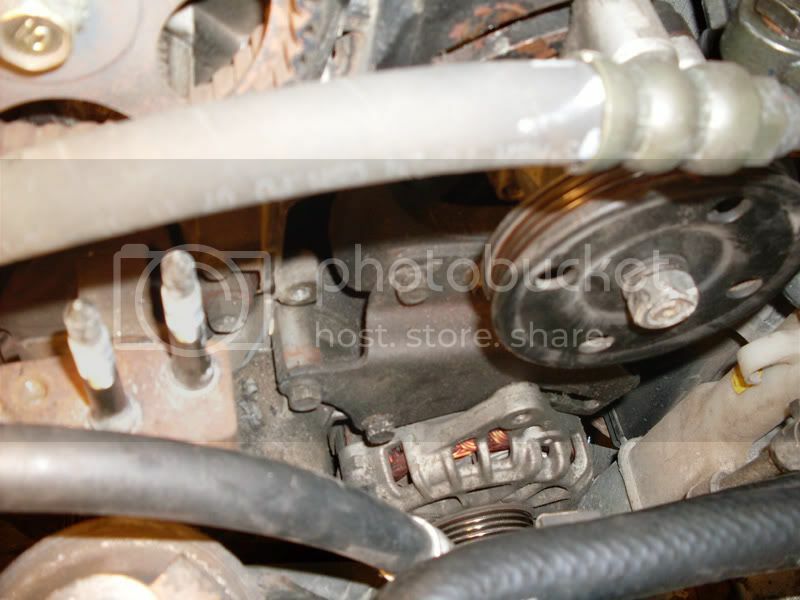 Reinstall the alt bracket and make sure the alternator adjuster and alternator are lined up before tightening any bolts. Reinstall the large metal bracket (3 -14mm bolts) and the idler pulley. 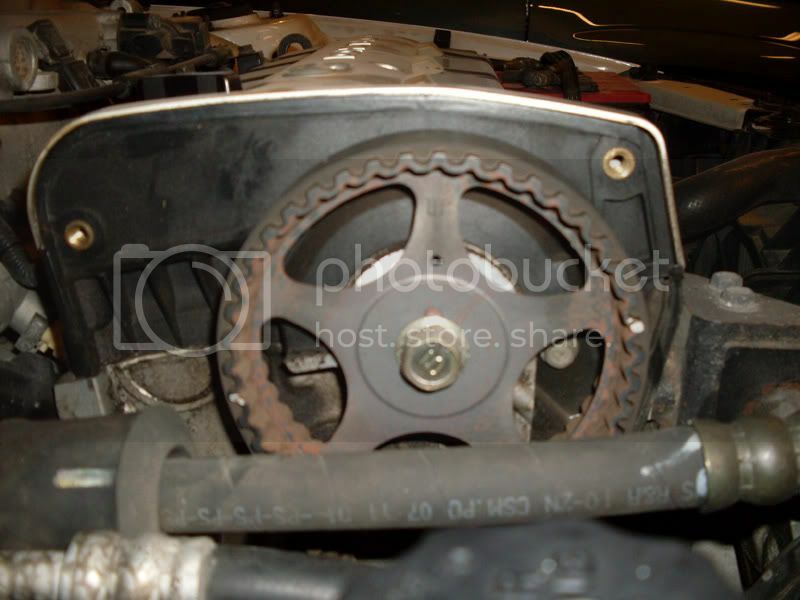 Now, install the timing belt on the cam gear first, fed past the idler and keeping it tight install onto the crank pulley. Now... if nothing has moved the idler side should be fairly snug and fit well. Now reinstall teh tensioner, and using a 3/16" allen wrench and the 14mm socket tighten the belt. Rotate the engine using the crank bolt 2 complete revolutions (720*) and recheck tension. If tension is correct, continue on. Reinstall the lower cover, the crank washer and pulley, the waterpump pulleys, 3 accessory belts, the metal support arm, the aluminum "A" shaped mount arm, reinstall the radiator drain plug and remove te jack. With the car still in the air, SLOWLY refill the coolant. With the nose up, and slow filling you will eliminate the likelyhood of air bubbles. Thisshould take about 1.5 gallons of pre-mixed coolant. Once everything is full, and tight. Start the car up with the radiator cap off and allow the engine to reach operating temps and add coolant as needed. This job takes me about 4 hours with the pump, about 2.5 without. This is my 4th. First time around took 6-7 hours and a lot of mistakes. PLEASE, visit http://www.hmaservice.com and sign up for a free account to get all the technical information I did not include.